You need to be a Dollar Bead Club Member to order this product. Please Login to your account or click here to Join. An easy way to string beads onto Beadalon wire - the Beadalon Sbeady Wire Needle! 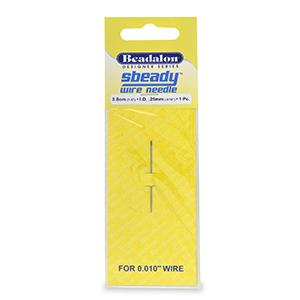 Designed just for the smaller diameters of Beadalon wires, the Sbeady Wire Needle comes in 4 sizes that correspond to wire sizes. So easy to use, just slip the wire into the end of the needle using the easy-slide half-open portion to guide the wire into the hollow needle. Push the wire all the way in, and you're ready to string beads! Copyright The Dollar Bead Club. All Rights Reserved.